GIS helped develop proactive plans to improve the quality of life in targeted hot spots. Using ArcGIS, crime reports were reduced and arrests decreased. GIS streamlines communication across city departments to improve the services for residents. 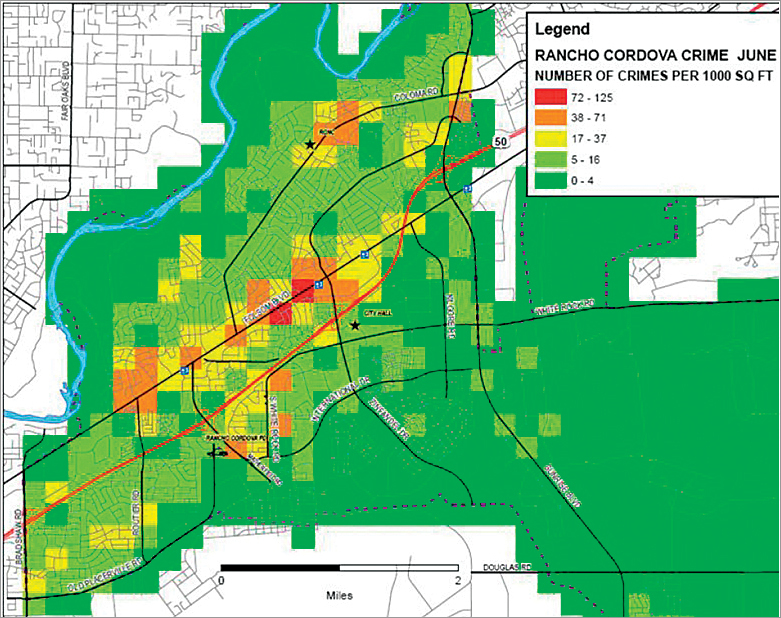 Located in Northern California, the City of Rancho Cordova is just east of Sacramento. With roots in the California gold rush, early railroading, and vineyard agriculture, the city is rich in community pride and has a diverse population of more than 66,000 residents. The Growing Strong Neighborhoods initiative is a cooperative effort among various departments and agencies to improve the appearance of properties, overall safety, and quality of life in Rancho Cordova. The city focuses efforts to establish pride and investment at the local community level with the goals of connecting residents as part of a common cause, ensuring residents feel safe in their environment, creating a thriving business climate, and increasing communication opportunities between the community and the city. 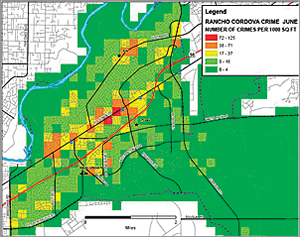 The City of Rancho Cordova created hot spot maps using ArcGIS to analyze and identify areas with the most crime- and code enforcement-related issues. To achieve these goals, the city focused specific services on hot spots within the community and took action to encourage an increasing number of people in the community to take an active role in the future of their respective neighborhoods. Efforts were coordinated among the city's Code Enforcement, Building and Safety, Police Department, Sacramento Metro Fire, and County Probation to target the areas with the highest concentration of issues. The program, which began in 2007, has changed the face of the city and continues to be expanded to encompass new areas of focus. Initially, the program focused on police calls for service, police reports, code enforcement violations, probation, and Megan's Law enforcement. Today, the city has increased its focus to include a panhandling task force and beautification efforts, such as graffiti abatement, landscaping, and street cleaning. The beautification efforts span city properties and encourage businesses and residents to take an active role in enhancing the appearance of their properties. The city worked with Esri Silver Tier Partner Interwest Consulting Group of Elk Grove, California, which is a GIS solutions provider with extensive experience implementing Esri products within local governments. The city was already using mapping products from Esri for other projects and daily maintenance of GIS layers. ArcGIS for Desktop and a customized ArcGIS for Server online application were selected because of their ability to spatially analyze and distribute data efficiently. GIS was used to define neighborhood boundaries; analyze community metrics; create and analyze hot spots; support police, probation, and code enforcement; and provide spatial before-and-after views of the city as progress was made. Multiple departments met to decide a weight to be applied to each of the factors that were mapped. The weights were applied to parcel data, and hot spot maps were created to help the city focus its efforts. Interwest Consulting Group's GIS team identified a list of focus areas with high overall scores when aggregating crime, code cases, and probationer locations. This information was then represented on a map, identifying focus areas for proactive action to change the negative impacts on the neighborhoods. GIS has helped to collect better annual metrics to detect citywide changes involving crime rates, housing characteristics, and school-related data (truancy/turnover rate). The city is able to focus work in a way that directly coincides with the needs of the community, allowing problem areas within the city to improve to a degree that does not drain city resources. Using the "Focus on 50" approach to target the 50 properties identified by GIS with the most issues, the city saw a dramatic decrease in crime reports and arrests for the three months following the targeted period compared with the three months prior to enacting the targeted approach. Better communication across city departments and related agencies has improved the services the residents receive. Community members see the work being done and want to become involved in shaping the future of their neighborhoods. Crime rates are down and probationers are removed if they are in violation of their parole, which translates into residents feeling safer in their neighborhoods. Property values have increased due to proactive code enforcement work and graffiti abatement. Attractive streetscapes created through Public Works' capital improvement projects have led to more commercial investment and activity, which benefits both the city and its residents. In 2009, the city spent $110,000 and 1,300 staff hours on graffiti abatement. From the month following the implementation of the Comprehensive Citywide Graffiti Plan until now, the city has reduced the costs to abate graffiti by 18 percent. This is due in large part to its efforts to restore pride in neighborhoods, enabling citizens to easily report graffiti they find and providing kits to citizens to repair minor graffiti violations within their neighborhoods themselves. For more information, contact Dr. David Sander, city council member, City of Rancho Cordova, or Mark Dumford, GIS manager, Interwest Consulting Group.